The new Autumn/Winter 2018 Collections are now coming thick and fast at Brolliesgalore, so today we thought we would look at some of the new umbrellas available from Fulton. Fulton Umbrellas are a well-known British fashion brand, based in London. They manufacture their own umbrella designs as well as making umbrellas for designers such as Cath Kidston, Lulu Guinness, Morris & Co and Orla Kiely, many of which we will look at more closely in future posts. Fulton are an established UK brand, founded in 1956 by engineer and inventor Arnold Fulton in a small factory in London, Fulton Umbrellas has grown to become the largest supplier of umbrellas and rainwear accessories in the UK today. The company also takes great pride in holding a Royal Warrant to Her Majesty The Queen, and previously Her Majesty The Queen Mother. In addition to this, our umbrellas are regularly used by the TRH The Duke and Duchess of Cambridge, and HRH The Duchess of Cornwall. The Fulton Autumn Winter range is sure to be a hit this season with some lovely new umbrella designs available in a range of colours. We have chosen a few of these designs to look at in our blog post today, but be sure to check out the full range on our Fulton Umbrellas page at Brolliesgalore! Manual frame, 8 ribsvision when walking. As used by the Queen! The Fulton Bloomsbury Double Canopy Umbrella in Lynx design is another new design from Fulton for this Autumn/Winter season. 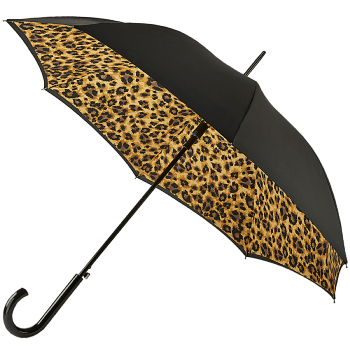 The Bloomsbury Double Canopy Umbrella by Fulton features a plain black outer canopy, and an inner canopy with a stylish Lynx animal print. With an automatic opening mechanism, this umbrella also features a lightweight high performance black steel frame and matching black glossy crook handle. A beautiful quality double canopy umbrella at an excellent price! Floral patterns are very much in vogue this season. This gorgeous trend is reflected in the Sketched Bouquet Minilite Umbrella by Fulton. This is a compact, lightweight manual folding umbrella featuring a dark background with beautiful floral design in pinks, blues & greens on a high-performance polyester canopy. With a special aluminium and fibreglass frame construction, cleverly designed to withstand inversion in normal wind conditions this umbrella can revert easily to its normal shape by simply closing and then opening the umbrella. Wooden handle. 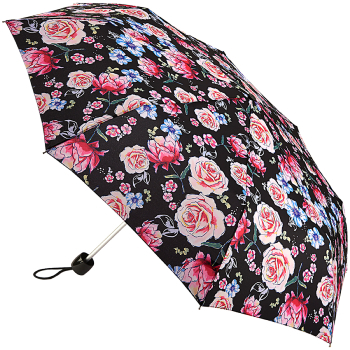 Our floral trend continues with this beautiful brolly. Another new Bloomsbury Double Canopy Umbrella by Fulton stars in the Autumn/Winter range for 2018. The Midnight Bloom Fulton Bloomsbury Umbrella features gorgeous floral inner canopy on a midnight navy background, and a plain black outer canopy. As with all Bloomsbury umbrellas, this has an automatic opening mechanism, a lightweight high performance black steel frame and matching black glossy crook handle. It's Father's Day again on the 17th of June and for many of us it can be notoriously difficult to figure out what to buy our dads this time of year. With the weather in the UK being so unpredictable, why not give them a gift that can be used all year round? At Brolliesgalore we have a wide range of umbrellas to suit all tastes and needs. Whether your Dad needs an umbrella for the daily commute to work, for use on the golf course at weekends, or perhaps he simply needs a more stylish designer umbrella for special occasions, we are sure to have the ideal umbrella for you this Father's Day. The choice of umbrellas in this blog post covers a wide range of styles to suit every budget. However, if none of these meet your gift-buying needs, you can see our full catalogue of umbrellas via the menu bar at the top of this page. We hope these suggestions help you in choosing your Father's Day gift, but if you do have any further questions, please let us know at the bottom of this page, or you can always contact us directly. chrome handle. Features tie band with popper fastener. The Senz° Original Walking Length Windproof Umbrella in Secret Fantasy design is a robust windproof umbrella ideal for those Dads into outdoor pursuits. Black outer canopy and grey and black Secret Fantasy design on the underside. The first and number one storm umbrella: the Senz° original is comfortable, stylish and designed so that it will never go inside out, even in a storm! The unique aerodyamic shape ensures you’ll never have to struggle with your umbrella again. The Senz° Original aerofoil shape allows this umbrella to float on the wind, making it very easy to hold with just one hand. Designed and tested to withstand a serious storm, with winds up to 80 km/h. The senz° original will not let you down in bad weather. What's more, thanks to a protective layer in the canopy, the Senz° Original offers UV protection of 50+ SPF. Ideal for sun, wind and rain! Comes complete with a luxury carry sleeve for ease of portability when not in use. If you are looking for a Father's Day gift with the height of windproof technology, look no further than the Blunt XL Golf Umbrella, here in Red. The Blunt XL is a revolutionary extra-strong, extra-large red windproof umbrella with Radial Tensioning System. 6 Double struts with telescopic floating ribs. This redirects, transfers and distributes tension right to the edge, where it is needed most. Creating a substantial unflappable, aerodynamic windproof canopy which provides effective shelter even in stormy conditions way beyond the capability of any conventional umbrella. Generous golf sized canopy. If the walking length and golf umbrellas are a bit too long for your gift-buying needs this Father's Day, then why not consider a compact automatic open & close folding umbrella that can fit easily into a briefcase or bag. The Black Fulton Open & Close Folding Umbrella by British manufacturers Fulton features a luxurious woven fabric and boasts an automatic open and close mechanism at the simple touch of a button. The umbrella has an extra large cover and comfortable wooden crook handle. This time of year the weather can be changeable to say the least, and as we look forward to those lovely summer days we have the spring showers to get out of the way first. An umbrella is (sadly) still a necessity at this time of year in the UK. However with those showers we can expect to see some gusty windy days too, so we would recommend choosing a brolly that works well in both rain and wind. In these situations, one umbrella in particular stands out. The Blunt Umbrella. Exceedingly popular with our customers, the Blunt Umbrella is the ultimate windproof umbrella that has been wind-tunnel tested to cope with the most extreme wind gusts. Its top performance windproof nature, coupled with its quality canopy, makes this a great choice to deal with whatever the weather throws at us. At Brolliesgalore we have the Blunt Umbrella available in three main sizes: The Blunt Classic, the Blunt XL Golf Umbrella and the Blunt XS Metro folding umbrella. 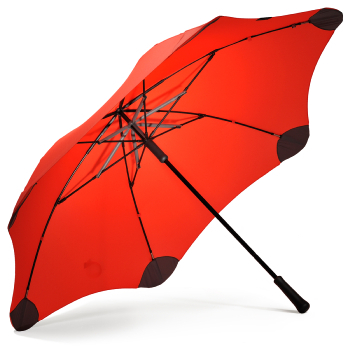 Revolutionary extra-strong windproof Blunt Classic umbrella in Red with Radial Tensioning System. 6 Double struts with telescopic floating ribs. This redirects, transfers and distributes tension right to the edge, where it is needed most. Creating an unflappable, aerodynamic windproof canopy proven on winds up to force 12 (117km/h)! Way beyond the capability of any conventional umbrella. Very generous canopy. The Blunt XL, here in Blue, is a revolutionary extra-strong, extra-large aqua blue windproof umbrella with Radial Tensioning System. 6 Double struts with telescopic floating ribs. This redirects, transfers and distributes tension right to the edge, where it is needed most. Creating a substantial unflappable, aerodynamic windproof canopy which provides effective shelter even in stormy conditions way beyond the capability of any conventional umbrella. Generous golf sized canopy. The Blunt XS Metro Folding Umbrella in Yellow features a 2 stage folding mechanism with the strength of Blunt RTS, BluntÒs revolutionary Radial Tensioning System. RTS creates an unflappable, aerodynamic weather canopy. It has been proven in winds up to Force 12 (>117 km/h) - way beyond the capability of any conventional umbrella. And its uniquely hard-wearing design means it will be a pleasure to use, year after year. Visit our full range of Blunt Umbrellas at Brolliesgalore today. The fabulous Bugzz PVC Dome Umbrellas for Kids are now back in stock at Brolliesgalore. Three of the most popular designs in this range had been out of stock for a while, but we now have the Ladybirds and Brollies, the Butterflies & Daisies and the Ponies & Hearts Bugzz Domed umbrellas available once more! On the subject of the Bugzz Domed umbrellas we definitely need to send out a huge (and belated) thank you to Carol - a blogger, photographer and author of a fantastic family-oriented creative lifestyle blog at www.muffandteacake.co.uk She very kindly gave us permission to use a photograph during our website redesign earlier in the year for the Bugzz Category at Brolliesgalore! So if you are looking for that last-minute gift idea or stocking filler for the little ones, you still have time to order for delivery before Christmas. Our last posting dates can be found on the front page of our website. But to recap, the last posting date for Standard delivery is tomorrow 20th December, and for Express Delivery it is Thursday 21st December. In our blog this week we thought we would take a look through some more new designs that have appeared on our site at Brolliesgalore this past week. Cath Kidston has released a new collection of designer umbrellas for the Autumn. A well-known household brand, Cath Kidston designs are well known for their lovely floral prints, homeware, bags and accessories. Brolliesgalore has been retailers of the Cath Kidston range of umbrellas for many years and we pride ourselves on providing the Cath Kidston brand values with excellent customer service. The designer Cath Kidston is one of Britain’s most popular retail designers, with her attractive vintage prints and countryside style. Cath Kidston umbrellas are also made by British manufacturers Fulton Umbrellas, so you can be sure of an umbrella that is excellent quality, well made and robust enough to deal with the not-so-accommodating British weather. These new umbrellas display her distinctive and traditional designs, and they are the perfect choice for anyone who appreciates excellent quality with a sense of nostalgia. This season's range features a variety of floral prints using a gorgeous range of colours. Manual Minilite folding umbrella features delightfully bold Beaufort Rose design by Cath Kidston over a navy canopy. This umbrella has a matching wrist strap attached to the colour co-ordinated soft-touch handle, perfectly finishing off this stylish folding designer brolly. Very compact and lightweight when folded but this umbrella has a full size cover when open. These superslim umbrellas features a trailing rose design by Cath Kidston and bear the Cath Kidston label. The Superslim is the lightest umbrella Fulton have ever produced yet full size when open! PVC patterned domed umbrella to cover head and shoulders made by Fulton Umbrellas featuring a Lulworth Flowers floral design by Cath Kidston. It's been a busy few weeks at Brolliesgalore as we are working on the redesign of out website. We are just in the midst of ironing out a few issues but once those are completed we hope to have the rejuvenated site up and running for you all soon. Alongside the website refresh, we have also been busy adding new stock to our site. One particular range of umbrellas that I'm sure will be a hit with our customers is the new Bisetti brollies. We have named these 'Bonnie' since not only are they very pretty, they have a distinctly Scottish flavour to them with flourishes of green and blue tartan among the fabulous floral designs. There are three models available, each of which you can see below, and they have slight twists in their designs. So whether you prefer flowers over tartan, or tartan over flowers, you will be sure to find the best design for your tastes in this gorgeous range of Bisetti Umbrellas. Available in three designs: Rose Border, Tartan Border and Ditsy Border; not only do these umbrellas each feature an attractive canopy, but they have been designed with a trusty aluminium frame and fibreglass ribs to offer the optimum balance between strength and weight. The Bonnie Bisetti Brollies also feature a wooden crook handle and beautiful antique brass effect fittings. The canopy provides excellent coverage when opened to its rather capacious 95cm span, keeping you well-sheltered from the elements.